Dental implants offer a permanent solution for your missing teeth. A dental implant is essentially a substitute for a natural root and commonly it is screw or cylinder shaped. Each implant is placed into a socket carefully drilled at the precise location of the intended tooth. Often the implant can be placed at the same time as removal of the tooth, all on the same day. Once a tooth is lost, the bone and gum will begin to recede. 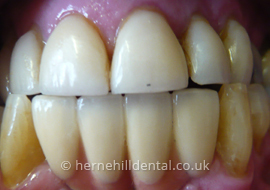 If you later decide to have an Implant fitted it may mean that the Implant would sit too high or the Crown would sit too low for your 'bite'. A material can be inserted into the cavity to encourage bone re-growth. Over time, this will provide a sufficient amount of bone to support the Implant. Sinuses are cavities inside the structure of our skull. When we lose a tooth, the bone around the root area starts to recede. This can lead to the sinus expanding into the tooth root area. If you choose to have an Implant there may not be sufficient bone to support it. Special material can be inserted to encourage bone re-growth and 'lift' the sinus. Over time, the bone will re-grow providing enough bone to support the Implant. A number of Implants may be used to secure a lower denture. A hole is made in the jaw bone for each Implant. The Implant is positioned and a Healing Cap applied. The gum is replaced while the bone recovers. Access to the Implant is made and the second part of the Implant is attached. 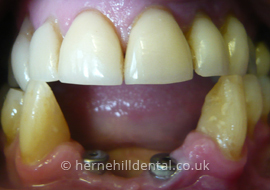 The bars are attached and tiny magnets in the denture then keep it securely in place.